Over 25% of organizations have adopted Office 365, up from 7% in 2014. How can organizations secure Office 365 given the increasing need to support BYOD and access from unmanaged devices? How can organizations protect data in the cloud? 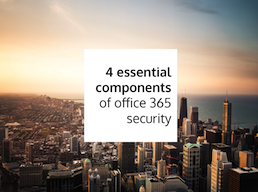 What are the core components of Office 365 security that IT leaders must be aware of? Join us for a discussion of the essential pieces of a comprehensive security solution for organizations that store or share information with Office 365. Click Attend to register below. If you have trouble with the form, click on this link to register.